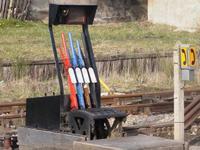 In order to gain access to the yard, the train must stop and the driver has to get out and manipulate these controls. 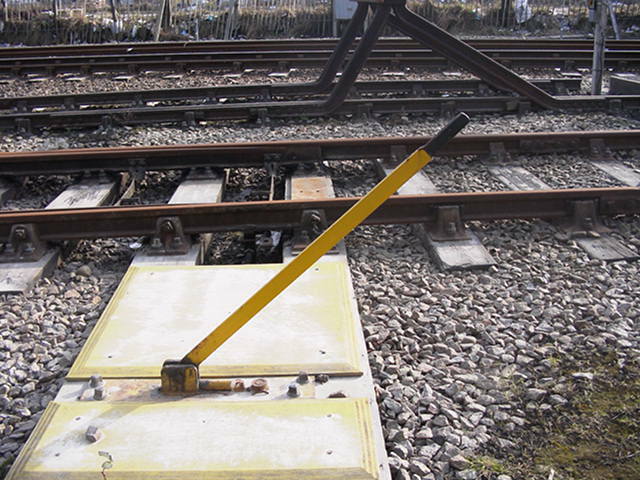 The first task is to pull the lever which unlocks the switch. The control lever is connected to an amazing series of throwrods, reversers, adjusters and redirecting pivots. The whole system is mechanical and is Victorian technology. 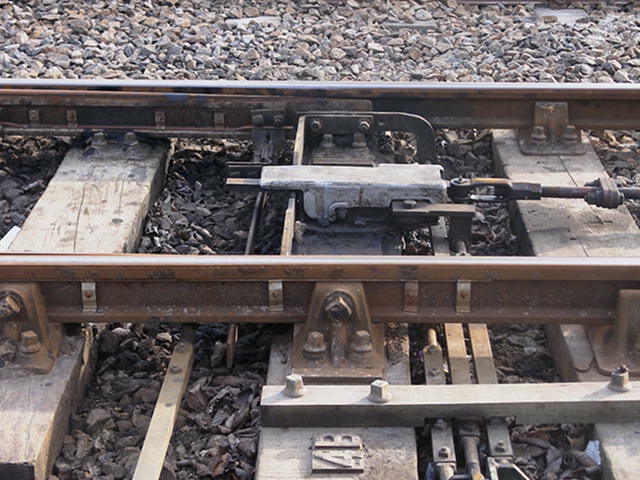 Eventually the connection makes it to the locking rod which jams the railroad switch into either its left or straight positions. 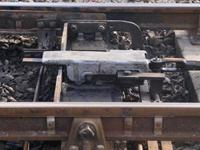 With the locking rod withdrawn, the switch is now free to be repositioned. But wait! 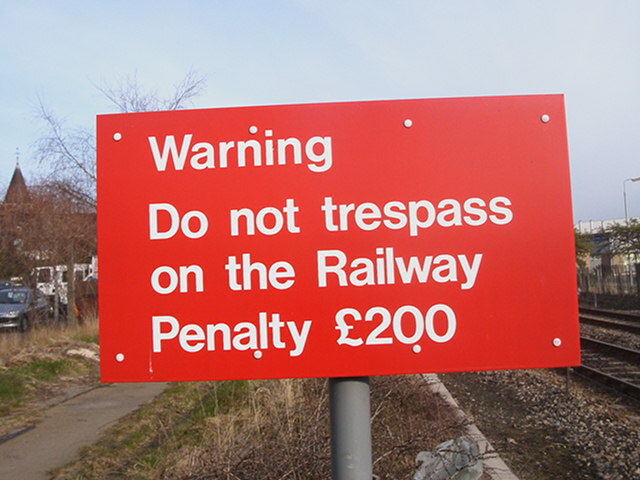 There's a small connection between the locking rod and an interlock. This interlock is the key to the system. 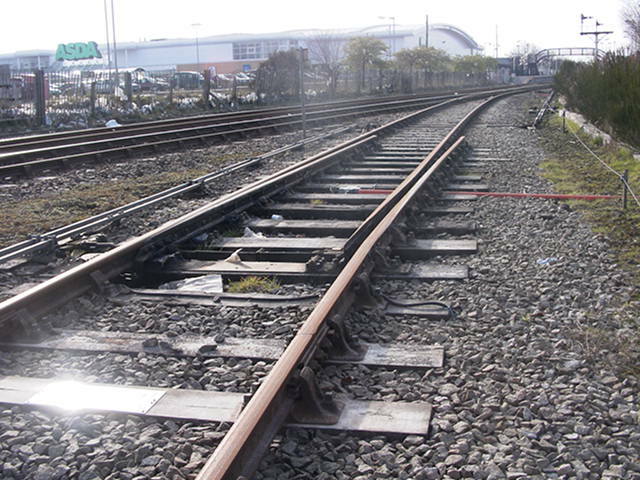 There are three rods (parallel to the sleepers) which come from the switch. 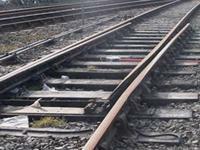 These intersect with two rods (parallel to the tracks) which come from the signals. Each of these five rods has a sequence of notches in them. 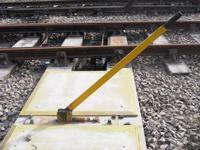 In this case, the locking bar on the switch will refuse to disengage unless both of the signals are set to 'stop'. Now that the switch is unlocked, the driver pulls a second lever which moves the switch to the left. 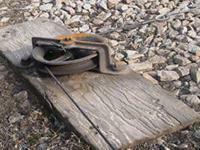 The throwrod which does this also deactivates the derailer. 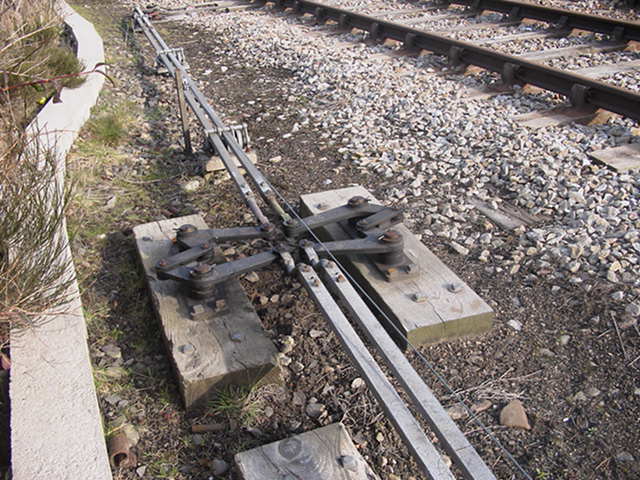 The derailer mirrors the switch position; whenever the switch is set straight (for the main line), the derailer will prevent stray freight cars from rolling out of the yard. They get sent to /dev/null instead. 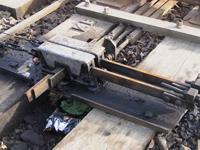 With the switch now pointing into the yard and the derailer deactivated, the next step is to slide the locking bar back into place. 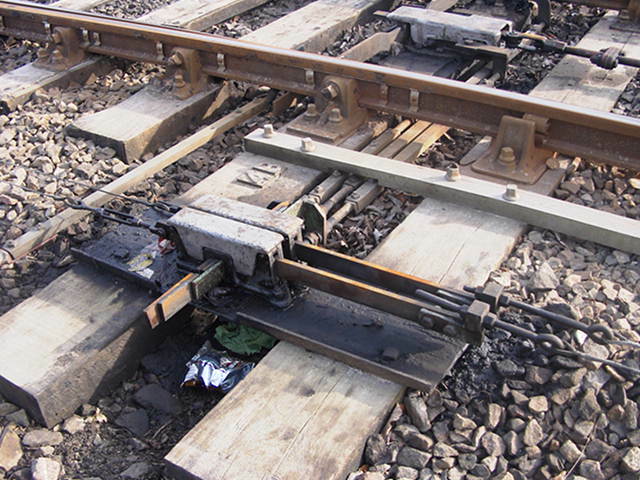 This will prevent the switch from moving under the weight of the train. It's just a matter of pushing the first lever back into position. 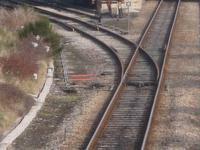 The next step is to raise the signal so that the train is cleared to enter the yard. 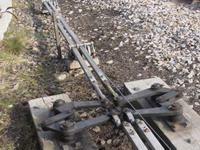 This is done by pulling the third lever. This system doesn't use throwbars, it uses wire and pulleys and is always in tension. 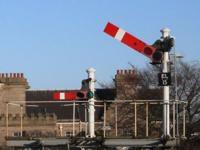 That way if there's a failure, a large weight at the signal will reset it back to 'stop'. Fail safe. 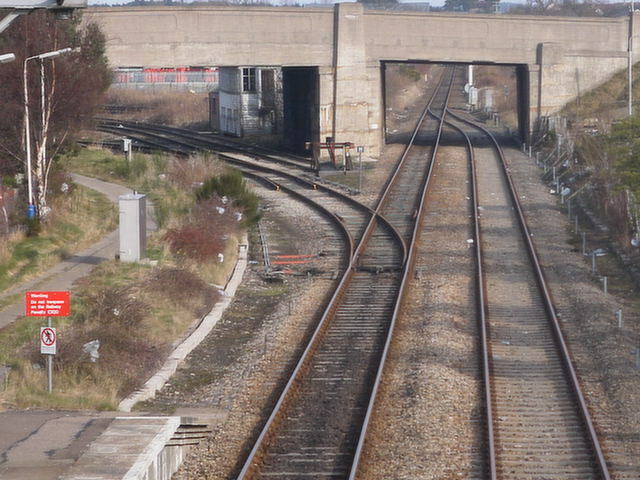 On the way to the signal, the wire passes through the switch's interlock. 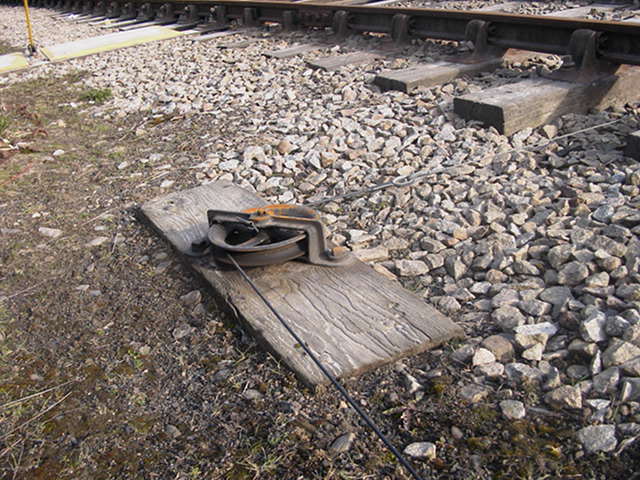 The notches inside make it impossible to raise the yard signal unless a) the left rail of the switch is in the correct position, b) the right rail of the switch is in the correct position and c) the switch is locked. 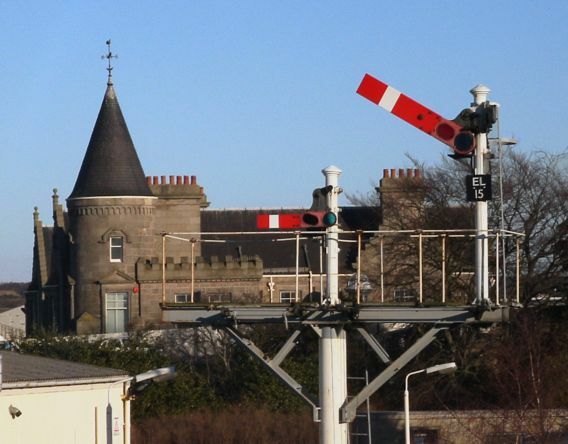 Assuming all the conditions are met, then the small semaphore on the left will be raised. 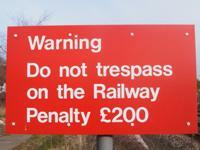 The train can now enter the yard. Then the whole process needs to be reversed to throw the switch back to the straight position. Once you get past that first switch, the rest is easy. Every switch thereafter is freely movable (and unlocked). In summary, this ancient mechanical system is completely idiot-proof. The interlock prevents anyone from making an illegal move. It guards against mechanical failure. It checks the results of actions, not the actions themselves. 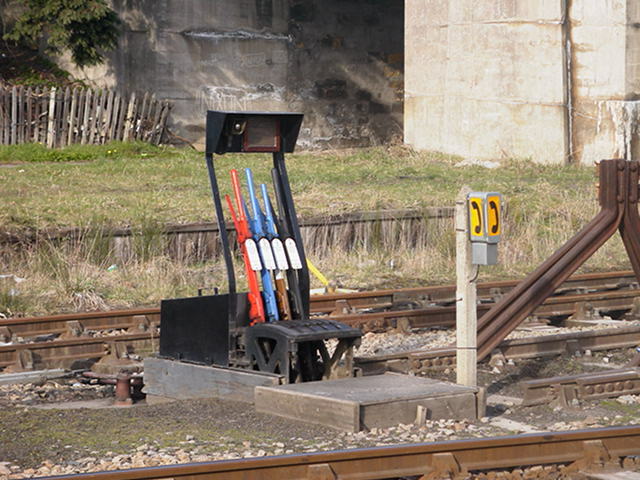 If this is the control system for a simple switch for a little-used freight yard, I hate to think what a major railway interchange looks like.